Commercial Print Solutions | Attributes | Consolidated Printers, Inc.
Consolidated Elections Services is committed to providing value-added services and responsiveness to its clients. We believe in providing value beyond just complying with a set of specifications during an election. We work with our clients in the election off-seasons and in the election pre-planning stages to help them improve their systems and processes. During the execution stage, we stand ready to respond to unanticipated needs right up to Election Day, whether due to increased voter registration, a judge’s ruling or any other precipitating events. We expect the unexpected. Consolidated Elections Services is focused both on County Voter Information Guides and Official Ballots and on services related to them. Our focus is not diluted by having an installed base of voting devices or election management systems. Consolidated Elections Services is committed to always maintaining excess production capacity so that we can address unexpected needs. This excess is maintained by (a) conservative planning in advance of the election and (b) aggressive use of our significant production resources early in the production process to establish and maintain a buffer. 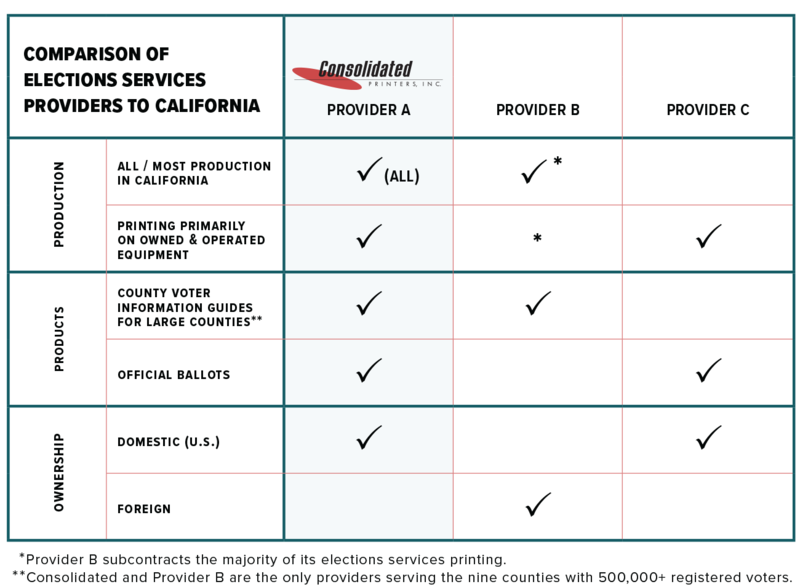 Consolidated Elections Services is the largest California-based producer of both County Voter Information Guides and Official Ballots printing principally on its own equipment. When we do outsource printing, we do it knowing that we have our own print facilities available as a backstop to our print partners. This control provides a real benefit to our client jurisdictions. The equipment at the Consolidated Elections Services facilities in Berkeley is distributed through three different structures at two different addresses. Consolidated Elections Services is one of the largest providers of mission-critical printed materials to California jurisdictions and is the leading California-based provider of both County Voter Information Guides and Official Ballots.